Samuel Worthington is writing from the Pea Ridge (Arkansas) Battlefield, though his unit did not participate in the battle. The letter is addressed to a friend named Enos. Worthington writes that "many gallant son[s] of the Union fell fighting for the Liberty of all mankind" He also notes that a friend Ben McCullough was killed near where he is writing and nothing marks the spot. 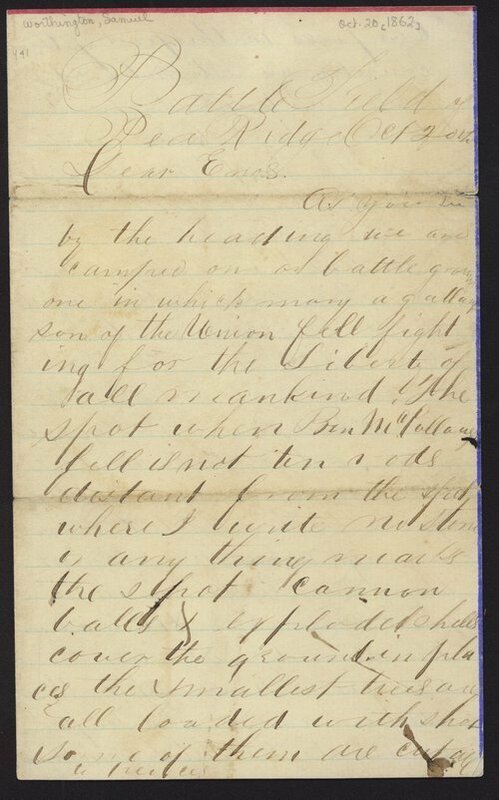 He includes information about Union and Confederate troops in the area, asks for news from the neighborhood, and that his money had been stolen. His signature includes the information that he is a Private in Company A, 11th [Cavalry] Regiment, Kansas Volunteers. Worthington's place of residence when he mustered in was Leavenworth, Kansas. Note that the stationery has red and blue lines on some of the pages.